Today we have three things for you at the top, followed by the usual roundup of links. We’ve got your doom and gloom and boom news from various fronts of the U.S.-China trade war today: currency, tech and investment, Chinese market opening, and the effects on stock markets. CNBC reports that China's currency hit a new six-month low against the dollar, spurring talk that trade wars could turn into a currency war. China has released a list of long-anticipated relaxations of “foreign investment curbs on sectors including banking, the automotive and heavy industries, and agriculture as Beijing moved to fulfill its promise to open its markets further,” reports Reuters. The list takes effect on July 28.The announcement confirms earlier promises “to remove ownership limits fully on industries such as insurance and autos within the next three to five years,” but it also also eases or scraps “ownership caps on businesses including ship and aircraft manufacturing, power grids and the breeding of crops, excluding wheat and corn.”“As Beijing relaxes the rules for foreign financial players, JPMorgan Chase & Co. said it is growing the headcount of its China-focused business and reorganizing its investment banking teams to better reflect the country’s economy,” reports Caixin (paywall). BYD, the leading Chinese car manufacturer that famously received investment from Warren Buffett, is using $1.5 billion to build a car battery factory with 24 gigawatt-hours (GWh) capacity by 2019, Bloomberg reports(paywall).The Qinghai-based factory will be the world’s largest of its kind, though not for long: BYD’s competitor, CATL, will also open one of the same size in 2020, and Tesla is still building a much larger “Gigafactory” in Nevada with up to 35GWh capacity. Tesla also plans to build a China-based battery factory, though no location or timeline has been announced for that one.BYD’s factory is part of a $3.8 billion investment to quadruple the company’s car battery output, from 16GWh now to 60GWh in 2020, according to Caixin (paywall).Wang Chuanfu 王传福, the chairman of BYD, declared last year that he expects all vehicles in China to be electrified by 2030, following the government’s announcement in September that it will end the production and sale of fossil-fuel-burning vehicles, likely within a couple of decades. Two children were killed when a 29-year-old man went on a stabbing rampage near a elementary school in Shanghai on Thursday, leaving another student and a parent injured. According to (in Chinese) local police in the Xuhui district, the bloody attack occurred around 11:30 a.m. when the suspect, surnamed Huang, allegedly brandished a large kitchen knife in front of the school gate. The man attacked three boys and a student’s mother, who were sent to a hospital nearby. Two of the children died in the hospital. The other two were wounded, but are not in critical condition. Police said the incident is under further investigation. A weekly summary newsletter on Fridays, so you never miss a beat in China news.A recap newsletter on Mondays, so you can rest easy on weekends knowing that we will catch you up on what you missed.Early listens to the Sinica Podcast, and direct access to guest expert Q&As via our Slack channel newsroom.Access to conference video recordings, and discounts to SupChina events in New York, Beijing, and beyond. A cleaning lady became an internet sensation for riding a hoverboard to work in Zhuhai, Guangdong Province. Dr. Kurt Campbell talks about his tenure as Undersecretary of State for East Asia and Pacific Affairs, and discusses the challenges of the U.S.-China relationship and the fascinating events that happened under his watch in China with Chongqing mayer Bo Xilai and blind activist lawyer Chen Guangcheng. Subscribe to the Sinica Podcast via Apple Podcasts, Overcast, or Stitcher, or plug the RSS feed into your favorite podcast app. It’s the last Thursday of the month, which means it’s quiz time! Here are 15 questions to test how much you know about religion in China, everything from Nüwa to Confucius, Taoism to Christianity. Let us know how you did — tweet your score @supchinanews. At the heart of the U.S.-China trade war is an ambitious Chinese plan to replace foreign technology with the country’s own. Here’s what you need to know about Made in China 2025. From homegrown smartphone brands to high-speed rail, China’s desire to be a world leader in technology is no secret. But recently, a Chinese state newspaper’s editor-in-chief called upon a more realistic assessment of China’s tech sector, a comment that has provoked reflection among the Chinese public. Who needs pensions when that money can be given to the Chinese government? A government website based in Yichun, Jiangxi Province recently published a rather bizarre user-submitted suggestion, one that has internet users asking: Is this for real? On June 14, an anonymous person posted a suggestion to the website of the Human Resources and Social Security bureau asking senior citizens to donate their pensions to the government. Ford, Baidu tie-up to put AI on the road/ Caixin (paywall)Don’t mention the mad cow disease ? 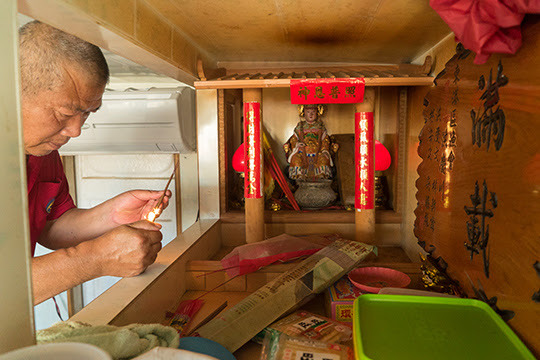 A captain pays respect to Mazu (妈祖 māzǔ), the goddess of the sea, at a shrine in his boat before sailing from Longmen in Taiwan. The goddess is believed to protect her seafaring followers from the dangers of the ocean.